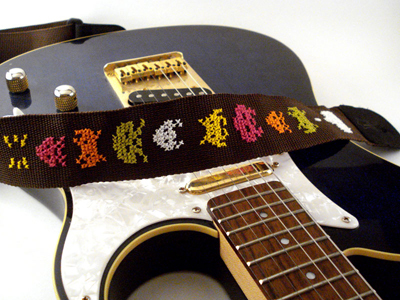 Renee of The Domestic Scientist made this Space Invaders cross-stitched guitar strap for her husband… his guitar is next for modding. 8-bit game graphics make great cross-stitch pattern because they have a very similar resolution. Keep that in mind for creating unique cross-stitch patterns for your crafty friends and family!